South of Lake Albert, along the border of Uganda and the Democratic Republic of Congo, lie the snow-capped Rwenzori mountains. Described by Ptolemy almost 2,000 years ago, the Rwenzori mountains are a World Heritage Site, home to endangered primates and boast the third-tallest mountain on the African continent (Wikipedia). The beauty of the range has been marred in recent years by rebel groups who have launched attacks from hideouts in the mountains. The Allied Democratic Forces have been described as a “rebellion without a cause,” but I think that’s incorrect. The ADF had many causes and sowed together Islamic fundamentalists, a defunct rebel groups (the National Army for the Liberation of Uganda), and former soldiers from the Zairean army – forced out when Uganda and Rwanda invaded the DRC to overthrow the Mobutu regime. Funded and armed by the government of Sudan, the ADF waged a long guerrilla war in Western Uganda exacting a heavy burden on the population. A more complete report of the conflict is available from IRIN News. Figure 1: Map of Uganda. The ADF affected districts of Kasese, Bundibugyo and Kabarole are immediately south of Lake Albert on the Uganda-DRC border. Image courtesy of the Landmine Monitor. According to the Landmine Monitor, 420 landmine survivors have been identified in Western Uganda as of August 2010. 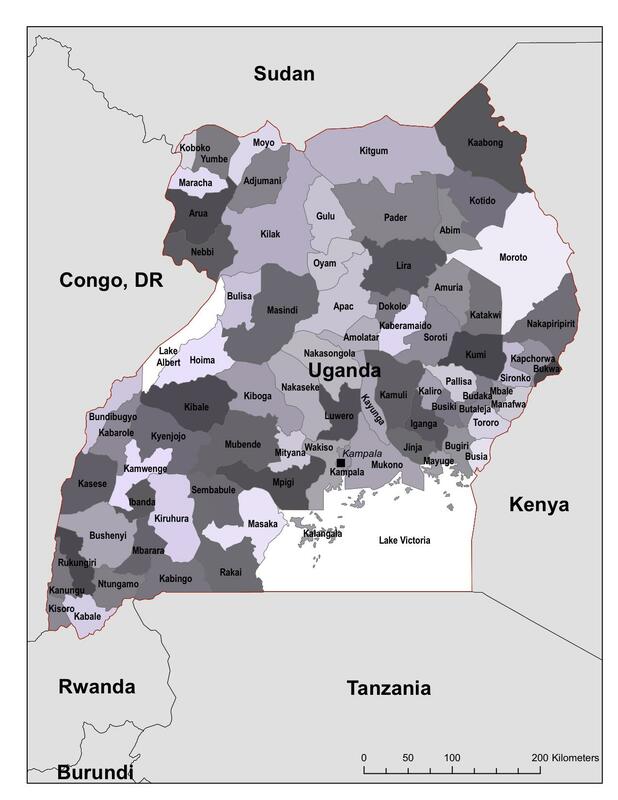 However, data for Western Uganda is incomplete: “Incidents resulting in death have only been identified in the north, most likely because data collection in the west has been mainly carried out by local survivors’ organizations whose primary interest is identifying survivors. As such, it is certain that people have been killed by mines/ERW in western Uganda who have not been recorded” (The Landmine Monitor). Anti-Mines Network-Rwenzori (AMNET-R) was established in 1999, by five teachers at Rwenzori High School after a Landmine hit and killed three children at the gate of Kibirigha Anglican Church. Today, AMNET-R is network of school clubs and community groups, including survivors groups, that uses community participatory approaches in mine risk education (MRE) to promote peace, a culture of non violence and protection of human rights. AMNET-R emphasizes respect and observance of human rights and campaigns against all infringements on human dignity because the respect and protection of human rights will lead to a peaceful, Landmine free Rwenzori region, stretching across the Uganda-DRC border. AMNET-R’s MRE program links surveys, demining and the rehabilitation of landmine and UXO survivors. Figure 2: An AMNET-R MRE session with women who farm in mine-affected areas. Photo courtesy of AMNET-R. Figure 3: An AMNET-R MRE session with the men who may engage in community-based demining or scrap metal collecting, exposing themselves and others to harm from landmines and UXO. Photo courtesy of AMNET-R.
AMNET-R also locates and marks hazardous areas for demining by the Uganda Mine Action Center’s demining teams. 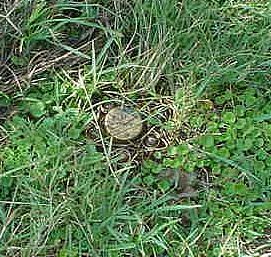 Figure 4: A valmara type 69 fragmentation landmine. AMNET-R found it near a Bwera hospital in December 2010. 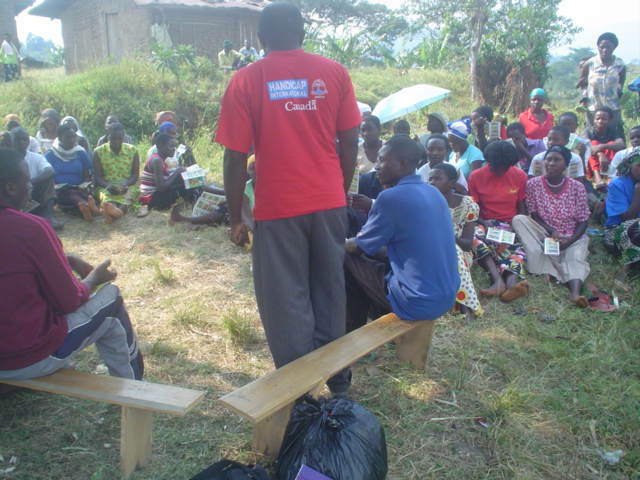 Photo courtesy of AMNET-R.
Victims of UXO, people with disabilities and support groups are identified, informed and refered to available institutions in the districts of Kasese and Bundibugyo. A directory of stakeholders engaged in the assistance of victims and people with disabilities in the affected areas is created and distributed. The network of support groups and associations enables peer-to-peer psychological support. In addition to the MRE handbook for AMNET-R, HI has produced radio programs to reach the largest audience possible with MRE messages; MRE posters, comics and t-shirts for children and teenager, whether or not they attend school; and a script for a 15-minute MRE film. 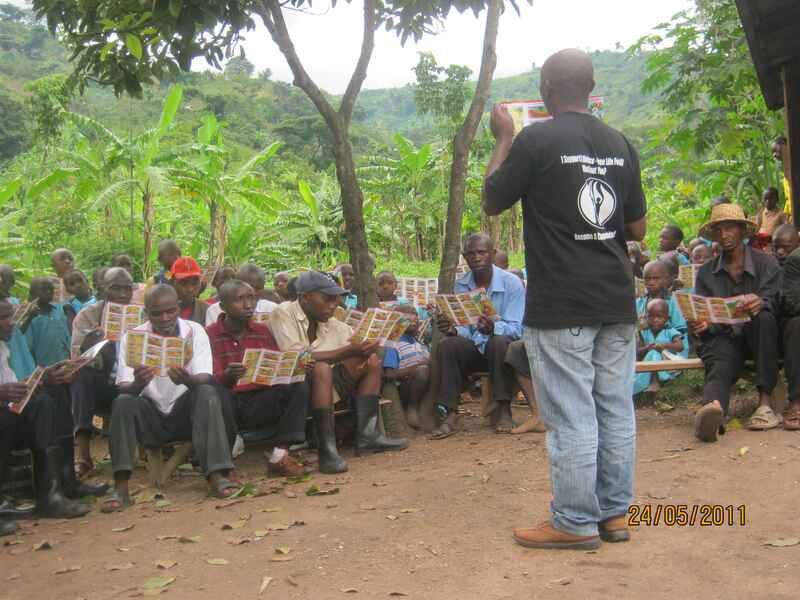 AMNET-R’s plans for 2012 include continuation of the current General Mine Action Assessment (GMAA) in western Uganda and continuing to offer mine risk education sessions in schools and local communities to reduce the risk of injury among people who live in mine-affect environments. This work represents a continuation of AMNET-R’s partnership with Handicap international. In addition, AMNET-R wants to conduct landmine surveys in eastern DRC to establish the level of the landmine contamination in the districts of Beni and Bunia which border Uganda. These surveys would serve as pilots for landmine surveys in other parts of North and South Kivu Provinces which have been subject to years of conflict and instability. AMNET-R is currently looking for an international partner to help implement the DRC surveys and would welcome any inquiries. AMNET-R has a small staff and a broad network of volunteers. Their head office is located in the western Uganda town of Kasese on plot 28 Rwenzori road and they can be reached via email at amnet_r@yahoo.com or directly through their General Secretary, Mr. Wilson Bwambale at bwambalewilson@yahoo.com. Handicap International UK can be reached via their website, http://www.handicap-international.org.uk/; on Facebook at http://www.facebook.com/HandicapInternationalUK; and on Twitter at http://twitter.com/hi_uk. My thanks to Wilson Bwambale (AMNET-R) and Beatrice Cami (HI-UK) for providing me with the information and images to prepare this piece. Any mistakes are my own.